As of June 4, 2014, the number of withdrawals from the CCP and its affiliated youth groups has reached 167,388,910. The following is a selection of “Tuidang” (Quitting the Party) statements made by Chinese nationals on April 13-17, 2014. All these years, the Communist Party has strangled our throats and hooked our noses, forcing us to follow it! They did all the bad deeds, but we civilians are the ones suffering the consequences! Today, we are glad that we have the chance to know the truth! We want to announce our withdrawal from the communist Youth League and Young Pioneers, to get rid of the evil Party’s mark of the beast, avoid disasters, and choose a beautiful future! The CCP’s evil and rotten nature is like a demon. 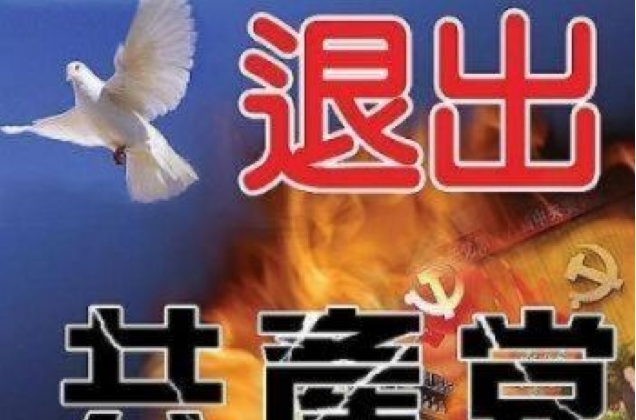 I voluntarily quit from the CCP and all its affiliated groups. I joined the Chinese Young Pioneers when I was a child, but this evil organization wages political movement non-stop, and has caused the deaths of many innocent people. Now we solemnly announce our withdrawal from this evil organization. We do not want to be their scapegoats. I want to be a clean and pure Chinese. Today, we watched a Shen Yun performance and learned the truth about Falun Dafa and CCP’s wicked history and nature. Therefore, we are making a solemn announcement of quitting from the CCP and all its affiliated organizations. We quit the CCP to gain protection from God! We can’t say anything now, but one day we will be able to speak, and everyone will say that Mao was a criminal to be condemned for a thousand years to come. In China there is no freedom of speech. Heaven has eyes! I quit from the CCP and all its related associations! We have followed the CCP all our lives. We have not done anything to our country and its people that might give us a guilty conscience. We have given our whole life to the country and the people, much more than to our own children. However, we were brainwashed by Marxism, Leninism, and Maoism. During the different movements, our house was ransacked twice, we were penalized and denounced, sent to rural areas to do labor. We have been deceived all our lives! If we died today, there would be an important thing we have not settled! We are a couple in our 80’s, we are determined to quit the CCP! My pen name is Lao Jia. For thousands of years, generation after generation, our family have been living in Changzhi City in Shanxi Province, but the CCP secretary of the city sold our farm land to a mining company without discussing it with any of us. Then office buildings were erected on this land. I cannot farm any more. I have appealed to the local government and all associated department. For 5 years I went to them countless time, to no avail. Why is it that this issue cannot be resolved by any of the responsible departments? Who is protecting the peasants’ interest? Why is it so hard for peasants to protect their own interests? When I was a child, I was a young pioneer. But today the government is too corrupt, the sooner I quit it, the sooner I am at peace! The head of CCP’s 610 office, Li Dongsheng, has been arrested. Those who have persecuted good people have received their retribution. I announce that I quit the CCP and all its affiliated groups. We are making this serious announcement of quitting the Chinese Young Pioneers. When I was young and made the oath to join the Young Pioneers, I felt that my body was being controlled by a demonic spell. I want to get rid of that demonic spell now. In this society, why are kind people always being abused and bullied and don’t get their fair share? I have been searching for the answer to this. After reading the book “Nine Commentaries on the Communist Party,” I suddenly came to understand, I am the lucky one because I did not join the Chinese Communist Youth League or the Party. In addition, I have learned about Sound of Hope radio and have become a loyal listener, so I am now able to know the true situation in China. I am very dissatisfied with the CCP because I have been wronged for many years. My fellow soldiers have posted information about my wrongful case on the Internet and Internet users in many countries have commented on it. Because of this, my QQ (Chinese social media) account was placed under surveillance. They [the authorities] did not give an explanation of my case and neither did they want to resolve it. I have not paid CCP membership dues for many years now, and want to make my announcement of quitting the CCP and its affiliated groups. 143,222,682 Chinese have publicly declared their withdrawal from the CCP and its affiliated youth groups as of July 31, 2013.